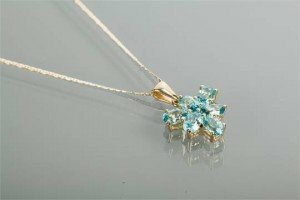 A 9 carat gold blue zircon cluster pendant set with six oval cut blue zircons, in nine carat yellow gold, on a nine carat gold chain. 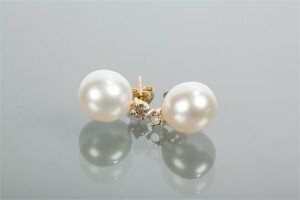 A pair of pearl and diamond earrings each with a large South Sea pearl drop suspended from a diamond stud, in eighteen carat yellow gold. 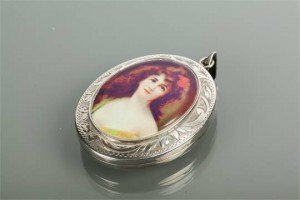 A silver and enamel portrait locket of oval form, with a female portrait to the exterior, engraved decoration to border, hallmarked sterling silver. 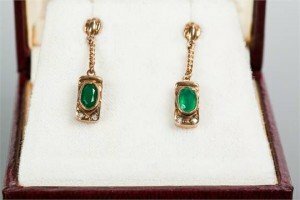 A pair of Victorian style emerald and diamond drop earrings, each formed by an oval emerald in a rectangular diamond setting, suspended from a twisted bar, in turn suspended from a stud, in nine carat yellow gold. 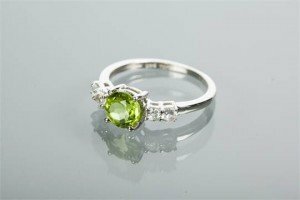 A silver peridot dress ring the central round peridot measuring approximately 6.5mm diameter, flanked by four smaller white gemstones, in silver. 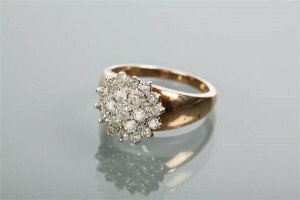 A 9 carat gold diamond cluster ring, the bezel of floral form, pierced and set with a cluster of brilliant cut diamonds, hallmarked nine carat yellow gold. 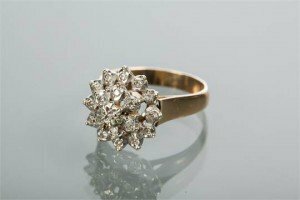 A 9 carat gold diamond cluster ring, the bezel of floral form, set with a cluster of brilliant cut diamonds, hallmarked nine carat yellow gold. 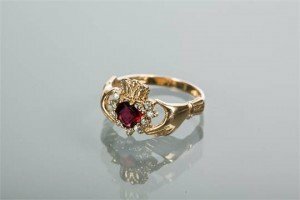 A 9 carat gold heart motif ruby ring modelled as two hands holding a heart, set centrally with a heart shaped ruby, hallmarked nine carat gold. 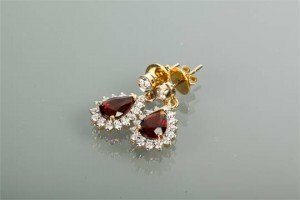 A pair of fine garnet and diamond cluster earrings each set with a pendeloque cut garnet surrounded by a row of brilliant cut diamonds, in eighteen carat yellow gold. 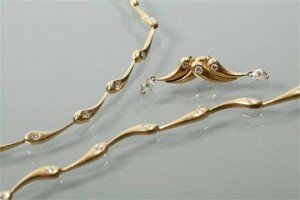 A suite of gold and diamond jewellery comprising of necklace, bracelet and earrings, the bracelet and earrings formed with curved droplet shaped links, each set with a brilliant cut diamond of approximately 0.05 carats, the necklace 38cm long, the bracelet 18cm long, the earrings formed as two curved droplets, with two brilliant cut diamonds of approximately 0.05 carats and 0.03 carats respectively, and with a marquise cut diamond drop of approximately 0.20 carats, all hallmarked for eighteen carat gold. 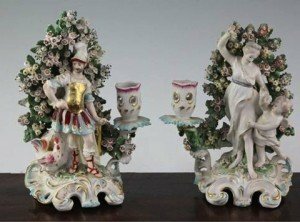 A pair of Derby candlestick groups, c.1770, modelled as Mars and a cockerel and Venus and Cupid standing before bocage, with detachable nozzles to each side, on scrollwork bases, pad marks to base. 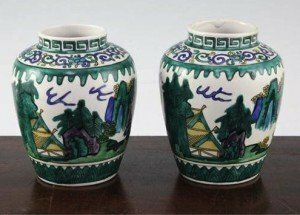 A pair of Japanese green Kutani ovoid jars, late 19th century, each decorated with pavilions in a mountainous landscape with scrollwork and lappeted borders, two character mark ‘Kutani’. 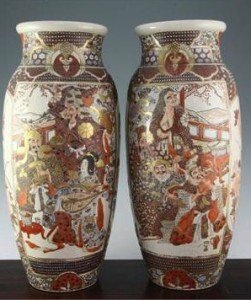 A pair of Japanese Satsuma pottery tall ovoid vases, late 19th century, the two vases painted with reserves of the Seven Gods of Fortune, the other side with samurai between floral panels and brocade pattern borders, unmarked. 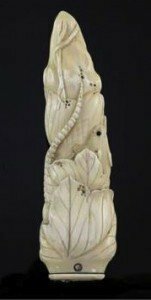 A Japanese walrus ivory paperknife handle, Meiji period, carved in high relief as a rat crawling amid leaves and tendrils. 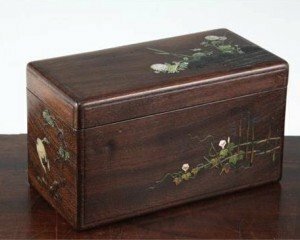 A fine Japanese shibayama type hardwood rectangular box, Meiji period, overlaid in mother of pearl, stained bone and wood with a basket of chrysanthemums, a sprig of prunus, convolvulus, a crane and pine tree and a bird amid millet. A Japanese coloured ivory figure of a bijin, early 20th century, the standing figure wearing a kimono carved with flowers and brocade, tinted in various colours, two character engraved mark to a red lacquer seal. 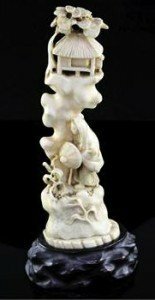 A Japanese walrus ivory okimono, early 20th century, carved as a lady holding a parasol walking by rockwork surmounted by a hut. 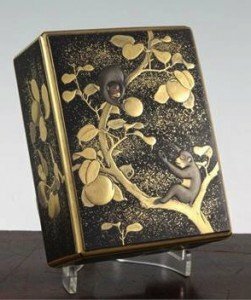 A Japanese gilt decorated lacquer rectangular box and cover, early 20th century, the cover decorated with two monkeys amid fruiting branches, the sides with similar fruits on a sprinkled gold and black ground. 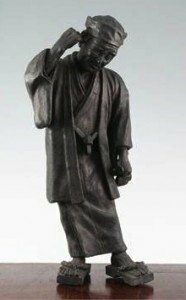 A Japanese bronze figure of an old man, 19th century, scratching his ear with his right hand and holding his smoking items in his left. 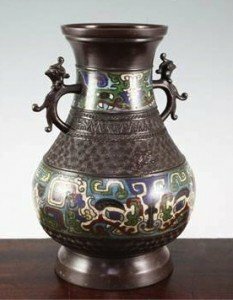 A Japanese bronze and champleve enamel baluster vase, late 19th century, in Chinese archaic style, decorated with bands of taotie masks, and applied with a pair of chicken head scrolled handles.